So I'm building a PokeMap! There is a build for it on git that allows me to run my own map. My main goal for the map is to see where poke stops and gyms are, but I'll enjoy the live character location details as well too. Right now I did it on a Digital Ocean droplet. I'm working to move it to my new Raspberry Pi though if I can make it happen there instead. Glad I'm not the only one here stumbling into the Pokémon Go unofficial dev/hacker community. Somehow it seems appropriate you'd be working on a map app. My first pull request was just accepted and merged a couple hours ago for one of the many projects floating in the grey area, and I'm definitely hooked and planning to dig into a few more this weekend. You know, I didn't even think about me making another map again. You are right though, it does fit. I actually ended up moving the map to my personal server instead of the Digital Ocean one I started with. I went from starting on Ubuntu to moving to my Cent OS 7. Now I'm going to see about the rPi, though I'll likely just leave it on my public server instead. Which map project did you decide to go with? 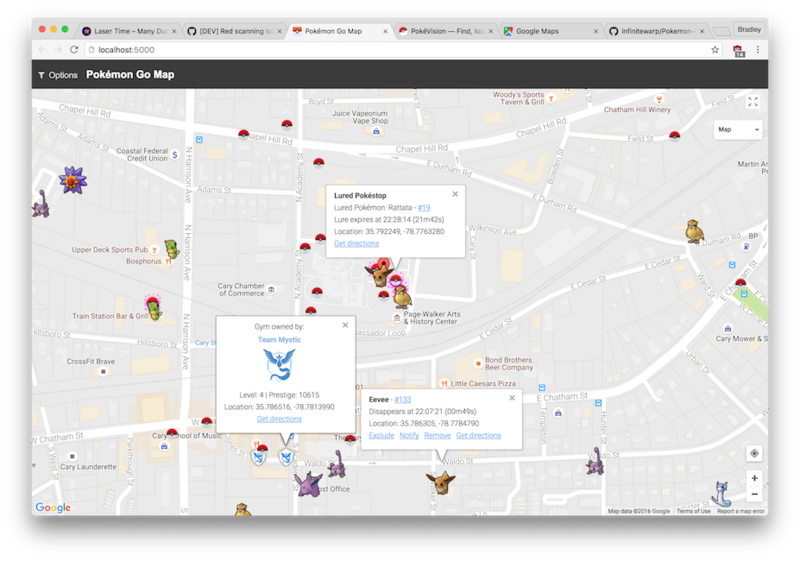 I'm running (experimenting with, mostly) PokemonGo-Map. 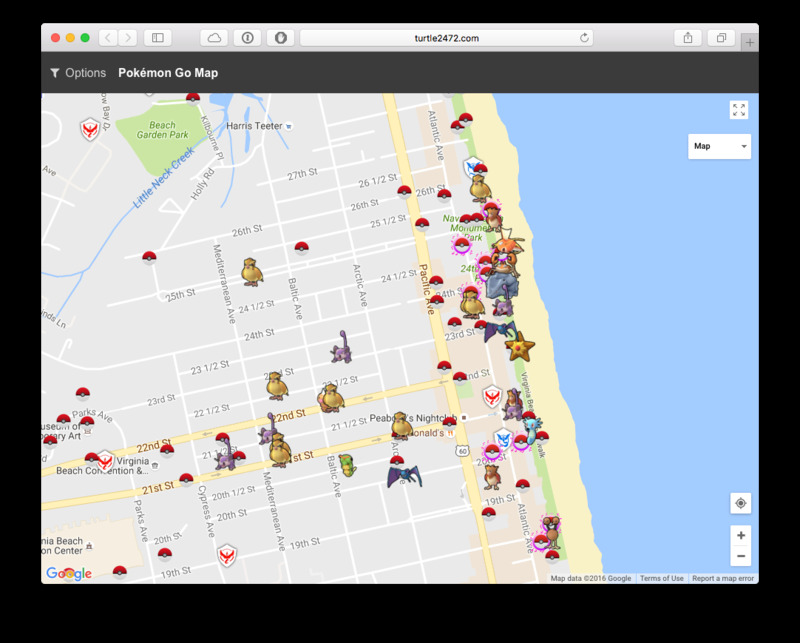 It works pretty well and looks really nice, but it seems to have some trouble showing pokéstops that are very close together. Some in my downtown park are just ~15 meters apart, and the nearest ones only showed one or the other at first. After a few scans, it managed to sort things out, though. Yep, that's the one I went with. I have done the recent release so I can use the config file on it. The one thing I haven't done it mess with scripting it yet. Currently I just have it in a screen session manually run. Where are you running your install? I haven't really seen an issue with the Pokestops after given them a lot of time to load. The Oceanfront is swarming with them as you can see from my screen shot. I don't go there that often so I don't normally have that many Pokestops in one area that densely. I'm running it on my local Mac. I'm a Python developer at heart; so, I already had the tools and knew exactly what to do when I saw it. 1. I don't use Apple's out-of-date Python. Instead I use homebrew to "brew install python" and use that instead. 2. I don't install requiresments.txt packages into my root Python library path. Instead, I use virtual environments. In addition, I use virtualenvwrapper to manage my various virtual environments because I tend to be working on several Python projects at any given time. I haven't backgrounded/daemonized it, but I figure I can just run it in a screen session. For now I just run it in the foreground shell to play with it. So which team IS everybody on? Brad is on Valor and I am on Instinct. There aren't many on Instinct in my area either. Oh well. @Brad, I'm certainly not on that level. My main server doesn't use python for anything right now so I just went by the instructions (sort of) and made it work for the server. I keep thinking about moving it to the Pi but I'm thinking I'll leave it on the Cent OS server since it does use MySQL now. Team Instinct here. (My GF made sure of that) I am level 17. Instinct here, just because there are tons of reds and blues. So, I wanted to do an experiment, as I'm not sure anyone has tried this already or not. Q: Is it better to *find* a fully upgraded pokemon (CP wise) or is it better to find a fully evolved, but super low level Pokemon and power it up instead? So I decided to test with Pidgies, since I have a million of them all the time. I also found an almost fully evolved and upgraded Pidgeot and captured it. The almost fully upgraded, found in the wild Pidgeot has a CP of 741, and has maybe 15% of the bar left to fill. The zero CP, upgrading it Pidgeot is just under halfway upgraded now, and has a CP of 261. I'm going to need a pile more stardust to finish the experiment, but so far it appears you are better off finding them as upgraded as possible in the wild, vs. doing it yourself after the fact. ... so far it appears you are better off finding them as upgraded as possible in the wild, vs. doing it yourself after the fact. That is the conclusion I drew too. I don't think it matters what evolution stage either, if you upgrade to 90%, the evolution is 90% from my trials. Therefore, higher is better if caught in the wild and transfer the lower ones. * I spent all my stardust in upgrading and those were still loser CP then ones I caught later. There may be certain exceptions with attack types and weight. I have yet to learn all those. I had heard that pre level ten vs. post level ten the upgrades get better, but it still appears that you're always better off finding as upgraded a wild pokemon as possible, then evolving from there. I won't know for sure until the experiment is totally done, but so far it looks like almost 30% higher CP totals. And I'm on Team Valor. I think that means I'm supposed to hate all you guys. Except Robo. He's cool. Valor bros 4life amirite? The answer is kind of complicated because you may want to account for the HP, attack types, attack strengths, and the hidden stats you can't see. In general, you're almost always better off finding new guys with high CP in the wild or waiting to power up unless you just have lots of stardust to burn. Also keep in mind that powering up a pokémon gets progressively more expensive as you approach the right side of the CP arc. As you level up, the CP of a pokémon you possess stays the same, but the maximum value of its arc grows. That means powering up a pokémon to a given static CP number becomes cheaper if you wait to level up yourself as a trainer before powering up the pokémon. When you evolve a pokémon, the new pokémon's CP should be around the same proportional mark on the arc as its predecessor. Therefore, IMO, the best solution is to find a high-CP unevolved pokémon and then evolve it without (or with only a little) powering it up. Did you... did you walk 160+ miles this month? Nice! edit: Some back-of-the-envelope calculation indicate that I walked 97 miles in this last month. I normally walk ~2.5 miles a day, which adds up to 75 for a normal pre-pokémon month. Yup, that is correct. 167.19 miles as of this afternoon to be exact. So the recent changes by Niantic have crippled the game a bit. The took away the feet range indicator and neutered the map sites out there. The one Brad and I were working with is crippled, but still works. I'm running mine on my Raspberry Pi now because my IP for the DO Doplet was banned. Time to invest in a super computer's worth of RPis. Since others were showing their rank, I'm up to level 19 now. Never held a gym long enough to get loot out of it either. Think you've got enough alcohol around there? Three bar/pub/tavern&grill places, a beer place, a winery, and oh hey, a vape shop for a little variety, just within that view. Never held a gym long enough to get loot out of it either. As soon as you add a guy you can get some loot, even if it is only for a minute. I just reached 19 now. Seems like the buggers break free more easily. Unless I'm totally missing some trick. The feet indicator was buggy and broken every release except the initial version. They just hid it I'm guessing until the system gets fixed. I noticed I have to use GPS now, before I could use other location services. And when internet drops out, the whole game stops instead of letting you play until connection is restored. I found a Karp nest but it is nearly impossible to fish there anymore. Yep! The cooldown timer only limits when you can collect from the last time you collected. So, if it's been more than 21 hours since your last collection, you can take a gym and *immediately* collect for the 10 coins. If you're *really* good, you can hit up multiple gyms and *then* collect, and you'll get 10 for each gym. Gyms fall so quickly after I touch them, though, that it's never worth the gamble for me. I just cash out ASAP and don't bother taking any gyms until the next day unless I just want to grind some experience. They actually *do* break free more often at higher levels, even the weakest 10-CP ones. It's totally BS and backwards, and it's apparently Niantic's way of trying to milk money out of players who are hooked. Shouldn't being a more-experienced trainer make catching low-level 'mon *easier*? And to add insult to injury, their latest weekend update apparently made it even harder across the board AND nerfed the "Nice!" bonuses for good aim. Word on the street it they're just taking it out completely. The feet indicator was never a problem server-side; the API reverse-engineering revealed that the "feet" and drawn locations are all handled client-side and are *trivially* easy to show. If there was any intent to make it work again/better, they could have done that as soon as it was found to be buggy. Well, it *is* the downtown area! Man, you should see downtown Raleigh by comparison. It's a bar/tavern on every block. It is SO hard to find Pokémon now. Maybe that is the point, but that's the wrong way to make the game harder. It's just more frustrating. Most of the time I just walk my normal route and if I happen to see a Pokémon I catch it, but it's bothersome knowing there's a Ninetails *somewhere* but who knows in which direction even!! I think they're gone permanently. My brother speculated it was to reduce load on their servers. It doesn't take much geometry, arithmetic, and logic to plot very good guesses as to a pokémon's location and distance. Heck, there are a dozen amateur open source projects doing this now from the data currently returned by the API. Unless Niantic is just truly incompetent in the software development department, which I actually am thinking may be a good possibility, there's too much evidence pointing towards this being a deliberate choice. So how do these map overlays work? You play in a browser to find what you need, then kick back over to the client to catch them/get loot? Right now, it's actually a bit tricky to get mapping tools working quickly and consistently. Clearly, Niantic is on a rampage to try to disrupt these bots (to the point that they have been introducing bugs that affect normal players the last few days).